I touch the goddess in your hand. I occasionally get requests to make bigger goddesses–people wanting figures that are large altar pieces 12-18 inches tall or taller. The goddesses I make are all about three inches tall and there’s a reason for that: they fit in the palm of my hand. When I create them, I feel as if I’m part of an unbroken lineage stretching back 30,000 years to the person who carved the Goddess of Willendorf. I feel connected to the priestesses of the Mesopotamian temples who sculpted hundreds upon hundreds of tiny clay goddesses. Someone commented on my sculptures once saying, “echoes of Mesopotamia.” And, I said, “exactly.” I feel the connection between the clay in my hand and the clay in their hands, running through the ripples and eddies of time. I’ve been inspired recently to re-read Starhawk’s The Spiral Dance, finding new bits of wisdom from it that speak to something different in me than they did the first time I read it. She writes of the attempts to discredit Goddess religion by invalidating the historical narratives or archaeological evidence: “The idea seems to be that if they can disprove our origin story, they can invalidate our spirituality…Is Buddhism invalid if we cannot find archaeological evidence of Buddha’s existence? Are Christ’s teachings unimportant if we cannot find his birth certificate or death warrant?…the truth of our experience is valid whether it has roots thousands of years old or thirty minutes old…a mythic truth whose proof is shown not through references and footnotes but in the way it engages strong emotions, mobilizes deep life energies, and gives us a sense of history, purpose, and place in the world. What gives the Goddess tradition validity is how it works for us now, in the moment, not whether or not someone else worshipped this particular image in the past” (p. 4). The ancestry of my goddess sculptures is not the energy that raised temples and built monuments (or walls), it is the energy that carried a baby on one hip and a basket of supplies on the other and needed a goddess just the right size to tuck down the front of a shirt. People might also look for altar pieces that stay in one place, but I create sacred art that goes wherever you do. 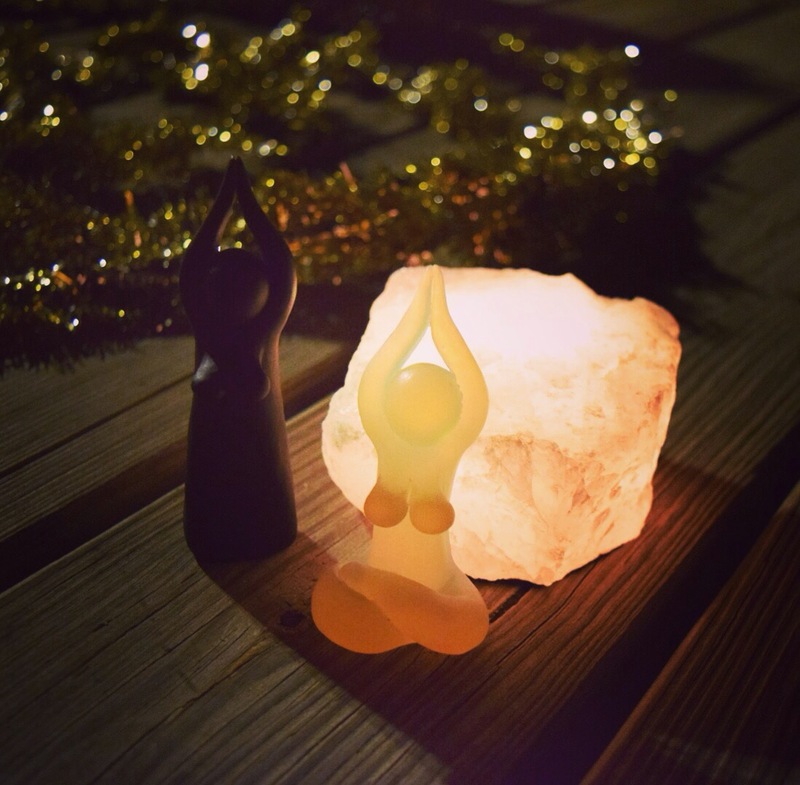 It makes my day when I see a photo from a customer of their goddesses living life with them, rather than dusty on a shelf, and I keep envisioning a collaborative photo book of these sculptures as they travel the world. In the last month, we’ve shipped goddesses to France, Sweden, Portugal, Ireland, New Zealand, Australia, the UK, and Canada. An archaeologist of the future may wonder why people in so many different geographic regions have little goddesses in the same style—perhaps this is evidence of widespread Goddess worship, they will say. Sometimes I describe my life in the woods as being held in the hand of the goddess. And, I make goddesses that I hold in my hand. Am I in the palm of her hand or is she in the palm of mine? The answer is both. We are also participating in a fun pay-in-forward giveaway on Instagram this week via Mother From the Heart. Our community’s first ever Pink Tent in the herstory of the world was held tonight. 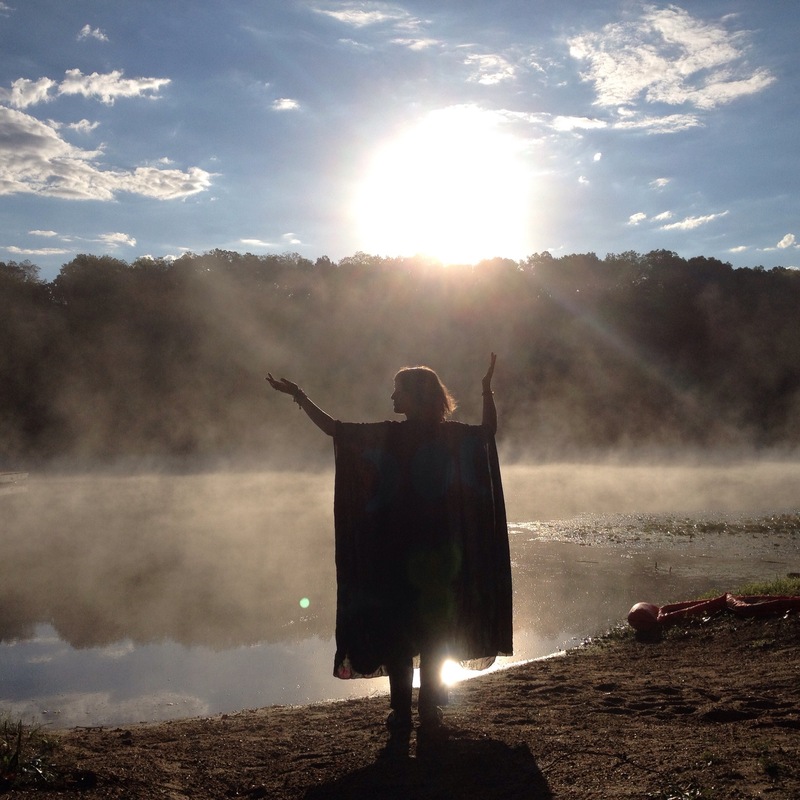 This photo is one of my favorites from the event and it felt like a beautiful evocation of today’s prompt. The wheel turns. Our youngest son is ONE today*. 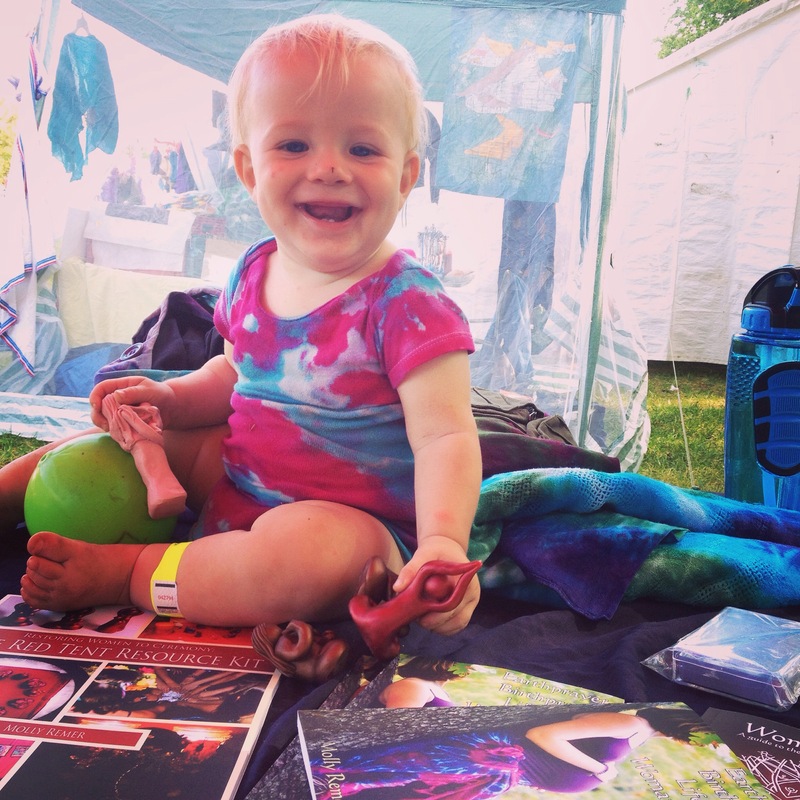 His pregnancy and birth was so closely aligned with the wheel of the year and my pregnancy with him was an incredibly generative time for our business (I wrote and published the Womanrunes book as well as sculpted more than twenty of our sculpture/pendant designs while pregnant with him!) I can hardly believe he is one now! Instead of leaping right into my to-do list when he was napping today, I sat with my cards and my Divination Practicum workbook. 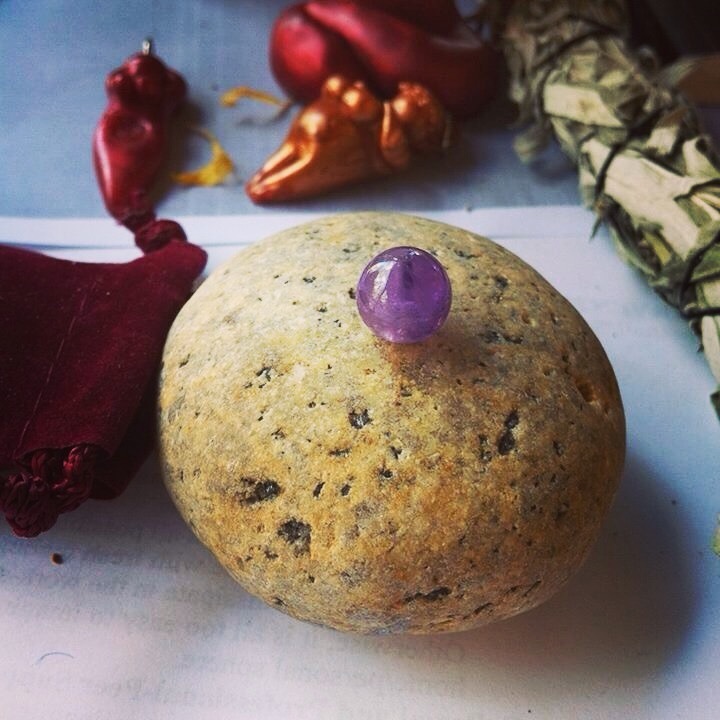 I’m really enjoying the many ways my own course dovetails with the prompts in the 30 Days of Hecate course. 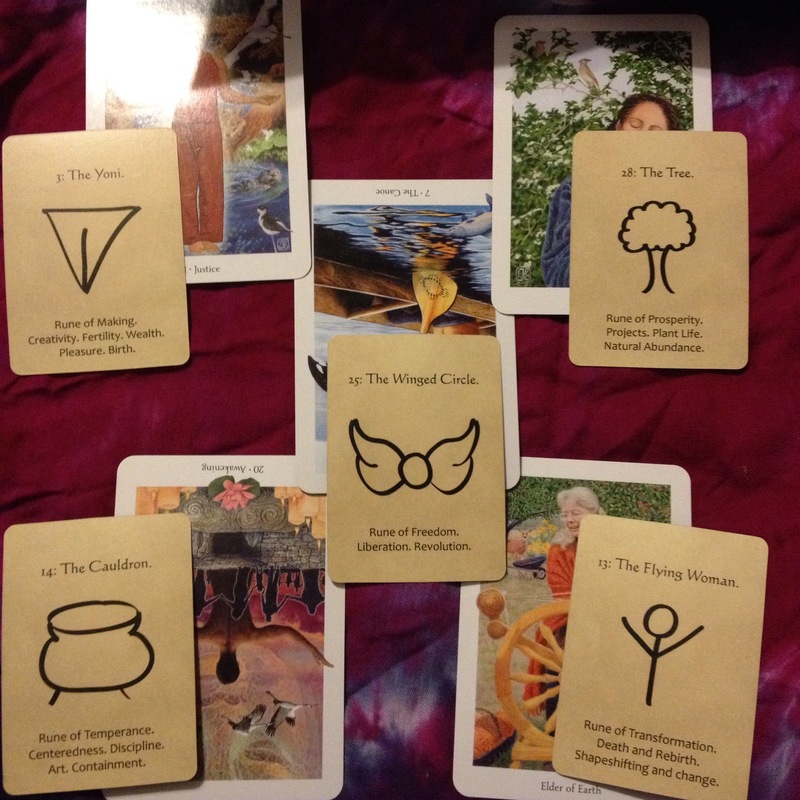 Today’s assignment was to do a tarot reading using Joanna’s “Elder of Fire” layout. 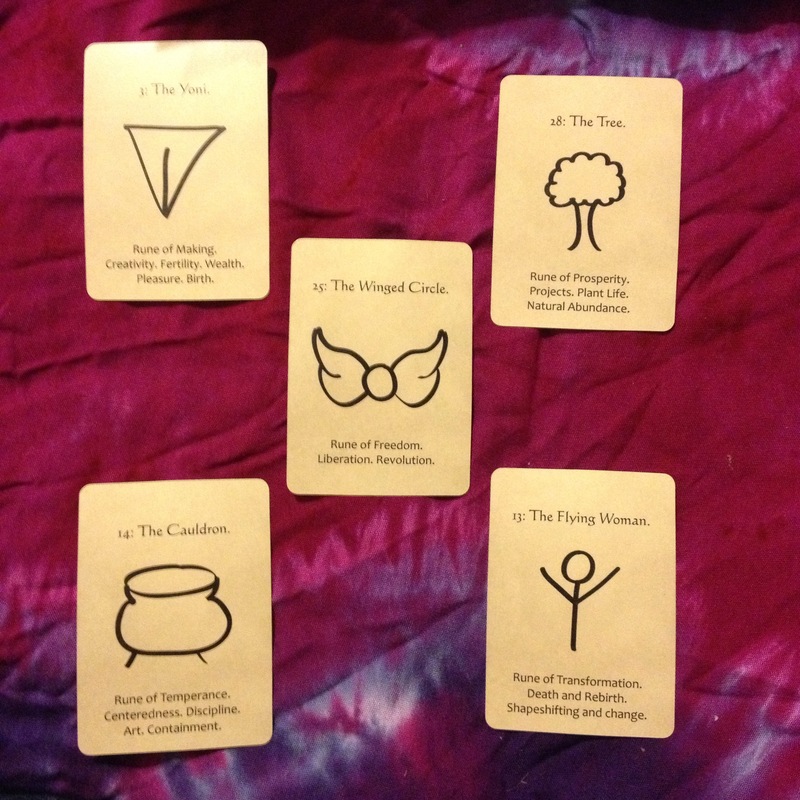 I did it with the Gaian Tarot (of course!) and then with Womanrunes. I learned from both layouts and felt like doing this was just what I needed today. I’d been feeling scattered, drained, touched out, and stressed. The kids are all sick and we’ve been what feels like nonstop busy and I’ve been craving down time, solitude, and space to think. My list is a mile long, but I made space for this work first instead of saving it for the oft-elusive “later.” This Elder of Fire layout feels like a really, really powerful layout to do at this time of year and I encourage you to try it yourself this weekend! I was also very interested to see that the rune of the day for me today was The Cauldron and then The Cauldron was also the first card for my Elder spread. That is very Hecate-riffic. 1. Offering: What or who is dead or dying, that you need to honor? 2. Challenge: What task does the Elder of Fire ask of you? 3. Center: Where do you find your center of power? 4. Opening: What new sweetness is wafting in on the scent of burning herbs? 5. Wisdom: What secrets do the ancestors whisper to you this All Hallows Eve? 1. Offering: What or who is dead or dying, that you need to honor? The reversed Awakening tarot card indicates that what is “dying” is being controlling and rigid, unwilling to hear the call of spirit. The Cauldron reminds me that something is waiting to be stirred–to be brewed up–and that what is passing away is a time of confusion or not knowing. 2. Challenge: What task does the Elder of Fire ask of you? The Elder of Earth here asks me “to be deeply content within” while the Flying Woman serenades me with her call to action and transformation. Interestingly, I’d already inked her on my wrist this morning holding the Cauldron. Even more interesting is that the takeaway part of her message in the Womanrunes book is to spin, spin together in the dance of life. And…look what she is paired with…the Elder of Earth spinning on her wheel! 3. Center: Where do you find your center of power? This one was a little more confusing because The Canoe in the tarot is reversed, which doesn’t feel very center of power-y. However, I read the description and actually laughed because it says, “perhaps you are pushing too hard and have lost the pleasure of the project.” I have been complaining all week of feeling too pushy and like I’m “revving” too hard trying to keep up. So, The Canoe reminds me to paddle and float and steer with focus rather than drive, per se. I’m not surprised to see The Winged Circle show up here—I’ve been tight and closed in and need to remember to spread my wings and to shake things off, opening to possibility. 4. Opening: What new sweetness is wafting in on the scent of burning herbs? Justice showing up here makes sense too, reminding me of balance. So, what better pairing to balance out my sense of tight, driven pushiness than the Womanrunes card, The Yoni: Rune of Pleasure. This rune relates to creativity and joy. Yes, please. 5. Wisdom: What secrets do the ancestors whisper to you this All Hallows Eve? The Two of Air shows up here telling me to make time for silence and to listen to the whispers of my deep self. And, to “move at the pace of guidance.” In a funny, literal twist, something that I keep snapping about this work is that I need quiet. I crave silence, I have said multiple times over the last few days. 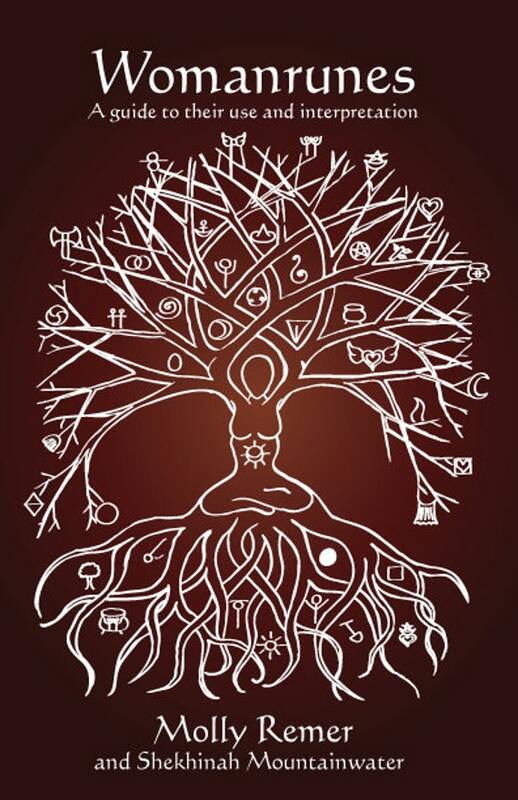 The Rune of Prosperity shows up here, connecting beautifully to the tree imagery in the tarot card and whispering to me to rest and let sunlight kiss my branches. After laying out the cards and journaling, I let myself page through the notes from my friends at my mother blessing last year as I prepared for my baby’s birth. It felt sweet and tender to allow myself that pleasure as I sit next to my napping now one year old boy, instead of immediately launching into my to-do’s, which is what nap time is usually reserved for (and indeed is usually the only sustained period of concentrated, creative energy I have in a day and even it is often fragmented by needing to pat his back or nurse him so he will continue napping). My husband finished uploading Tanner’s birth video today in honor of his birthday. I know that not all of my followers here are interested in childbirth, but if you are, the video is here! *Note: I keep saying “today” in this post because I started it on October 30th, which is the day it goes with. However, it isn’t actually publishing until the 31st, because it got really late before I could finish writing it! and feel the sweetness of honey on your tongue. May your rooms be wreathed with smiles. found in both gathering and releasing. What is it that calls me in the night? and what remembering is right here. I’m excited to announce my newest online class! 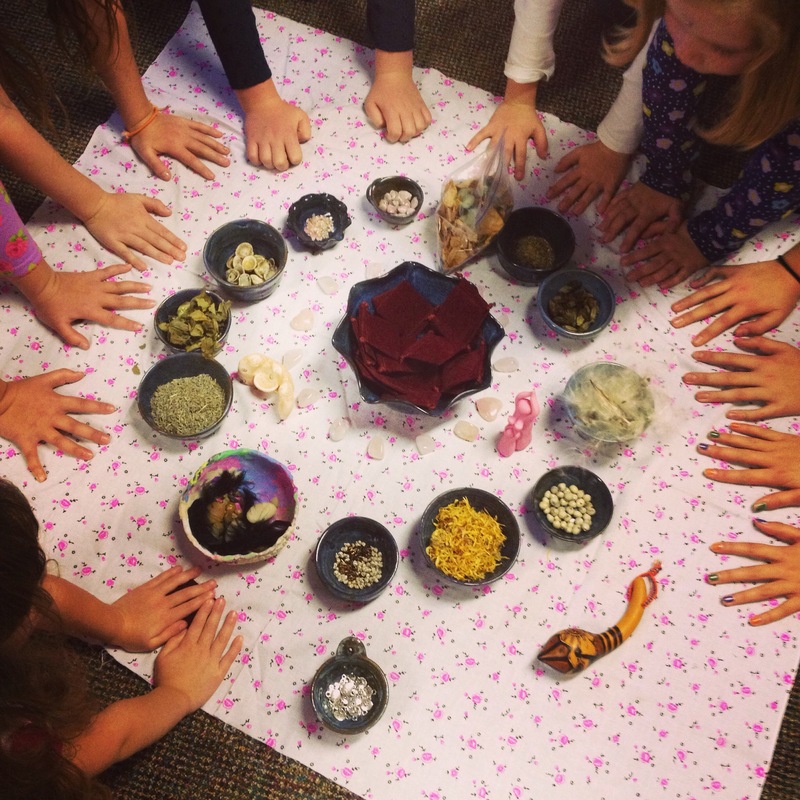 Listening to the Deep Self, a six-week divination practicum for women begins online on October 27. Early bird registration pricing ends September 25th! Register via our Brigid’s Grove website. I’m feeling relieved to be home now from Kansas after five days away. 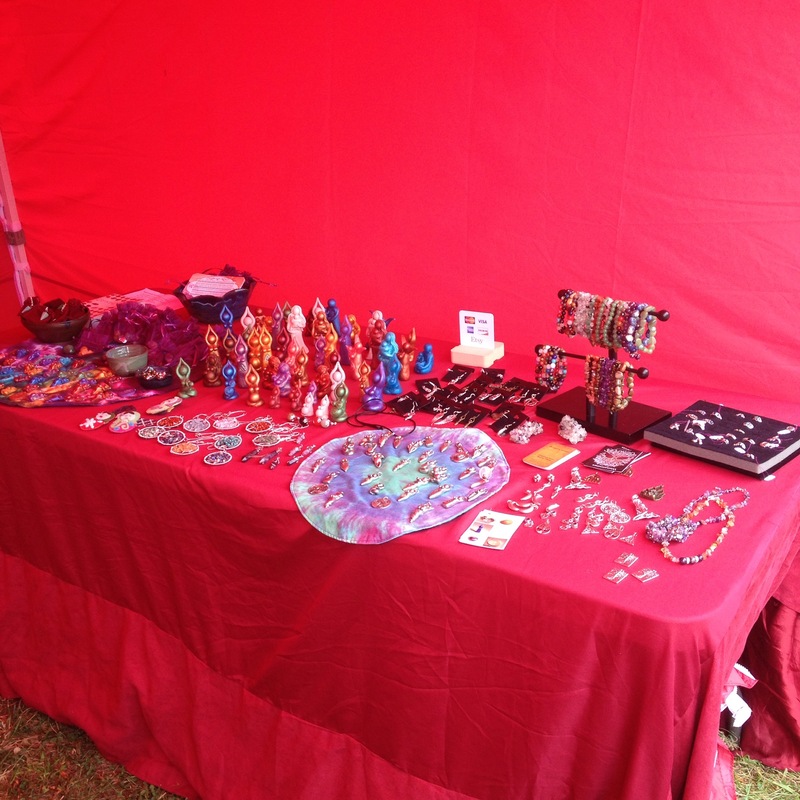 Gaea Goddess Gathering was a multifaceted experience as always. Vending was so rewarding with lots of lovely connections woven and stories shared. Many other elements felt like something we survived! 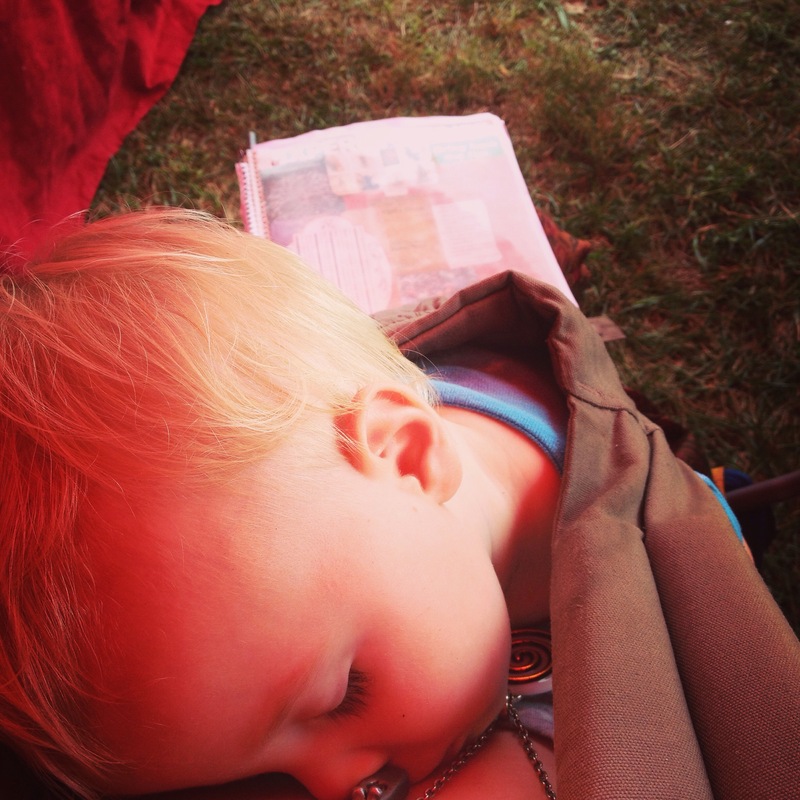 It is quite physically taxing to be there–not enough food, water, or sleep, too much climbing up seventy steps up a steep hillside while breastfeeding + babywearing! And, this year there were weather extremes–first, 90+ degrees, follows by rain and wind, then cool. I couldn’t have done it without my mom’s help with my daughter and with the help of my SIL and my mom with set up/take down of the booth. Time again to dance in a circle of women! 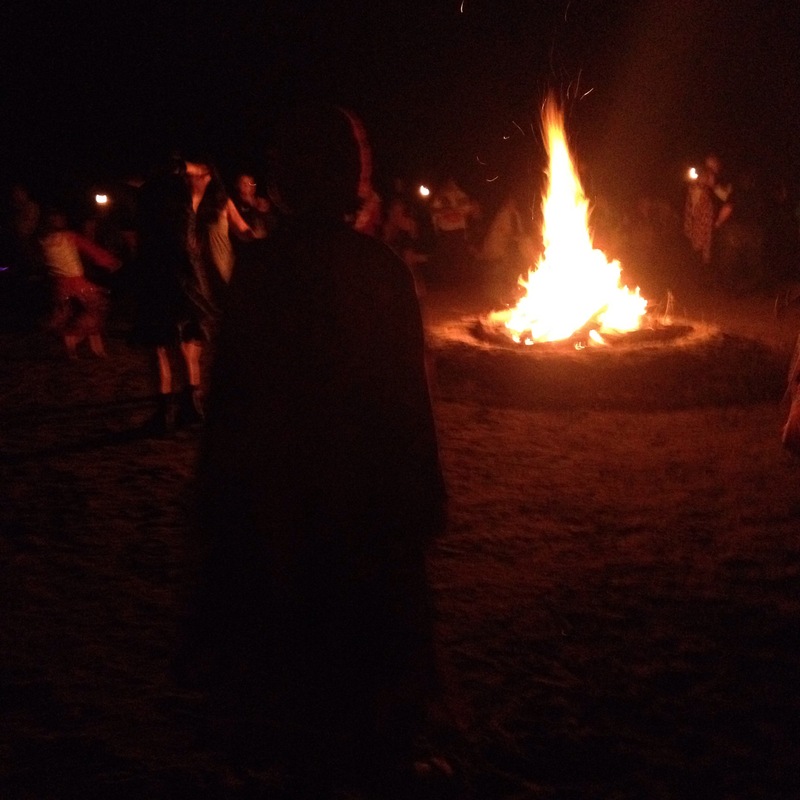 Tonight, the main ritual honored the Morrigan and encouraged us all to rise up. 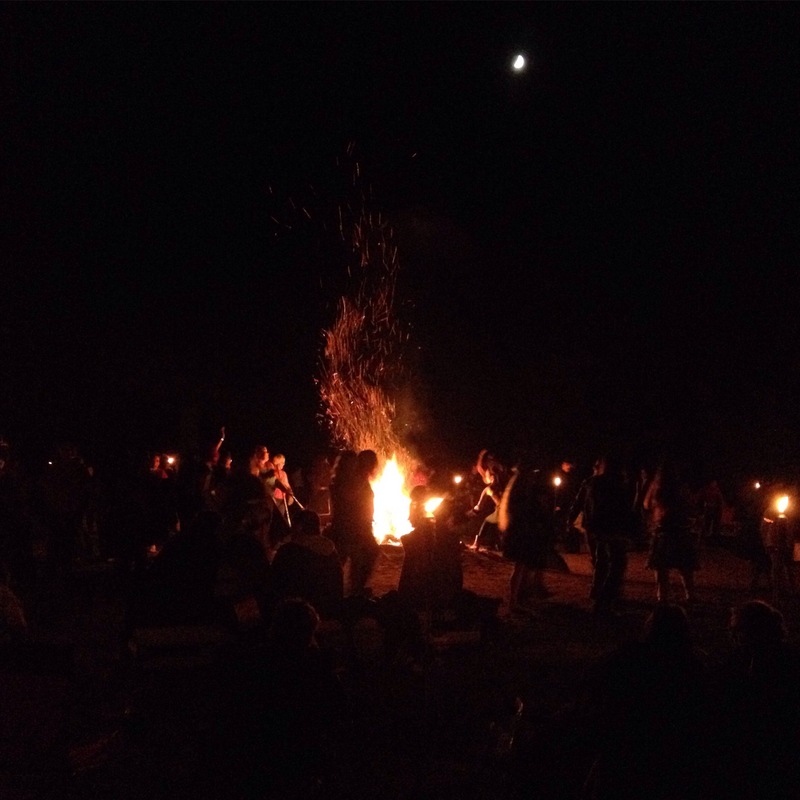 As we chanted, the coyotes howled and the fire rose up in a shower of sparks under the crescent moon. We’re at Gaea Goddess Gathering! The Brigid’s Grove booth is almost finished being set up. Very hot today and rain called for tonight. Beautiful evening for the opening ritual though. Crescent moon to the south while the sun was setting in the west as we called in the Morrigan. Now, lightning is sparkling through the dark sky as the bonfire burns. and throw on it all that you would use to harm yourself. The Spiral in Womanrunes is The Rune of Initiation. Our spiral goddess pendant represents and reminds me of this lifelong process of initiation. A pivotal initiatory point for many women is giving birth and I wore this pendant all through my last pregnancy, including in the birth pool in which my last son was born. She carries the imprint of that power for me, a reminder of my own capacity to change, grow, welcome, and create. I consider her a pendant symbolic of initiation for many events, whether a personal life transition (such as childbirth) or as dedication to a particular path, life purpose, or journey. This is the pendant of initiation. This is the pendant of change. It is time for dedication to your sacred path. Pewter Spiral Goddess Priestess Initiation Pendant by BrigidsGrove. Open arms to the sky. Touch my spiral pendant and say: Initiate yourself. Initiate yourself.